Lancome La Vie Est Belle L'Eau de Parfum Intense plunges into the world of fairy tales & magic. 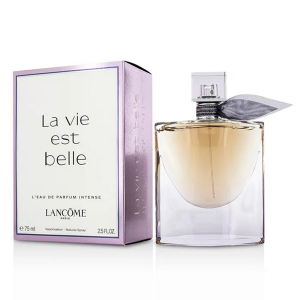 Lancome La Vie Est Belle L'Eau de Parfum Intense 75ml. Eau De Parfum - Delicious, sweet and incredibly intense fragrance helps to plunge into the world of fairy tales and magic. Its smell reminds aromas of fine desserts, for which any sweet tooth will be ready for anything. The sound of music is very rich and they are gradually transformed into each other, forming an incredible combination. Fragrance creates the illusion of falling into the sweet fairy tale, where the mountains, forests, trees and houses are made up of different delicacies. I want to return to childhood and to enjoy the free flight of fantasy and unconcern. Flex differs high stability, so it will be easy to find out all the friends and acquaintances of the owner of the perfume. Pyramid composition contains a large number of components. That is why the creators of the perfume Lancome La Vie Est Belle L'Eau de Parfum Intense achieved such stunning success. Amazing top notes consist of pear, orange, bergamot, pink pepper and kidney currants. They sound very bright and expressive, then slowly added to it even more intense notes of heart, composed tuberose, iris, jasmine sambac, orange blossom and ylang-ylang. And finally, in advance serves a unique duo whipped cream and hazelnuts.